NASA’s Mars rover Curiosity took this selfie in the Murray Buttes area, on the lower flank of Mount Sharp. Five years after touching down on Mars, NASA's Curiosity rover mission is still making big discoveries. On the night of Aug. 5, 2012, the car-size robot aced a dramatic and harrowing landing, settling softly onto the Red Planet's surface after being lowered on cables by a rocket-powered "sky crane." The success of this unprecedented (and seemingly improbable) maneuver sparked eruptions of emotion at mssion control at NASA's Jet Propulsion Laboratory (JPL) in Pasadena, California — and at late-night viewing parties all over the world. Curiosity landed on Mars at 10:17 p.m. PDT on Aug. 5 — that's 1:17 a.m. EDT on Aug. 6 (0517 GMT) — with the signal of its success reaching Earth 14 minutes later after crossing the 154 million miles between Mars and Earth. But that's not where Curiosity's story ends. The rover has continued to piece together details about the ancient Gale Crater environment — work that has led to another exciting find. "I feel like we're arriving at a second conclusion from the mission that's just as powerful as the first, which is that habitable environments persisted on Mars for at least millions of years," Curiosity project scientist Ashwin Vasavada, of JPL, told Space.com. Curiosity worked near its landing site on Gale's floor for its first year on Mars. Then, the nuclear-powered rover began a 5-mile (8 km) trek to the towering Mount Sharp, which rises about 3.4 miles (5.5 km) into the Red Planet sky from Gale's center. The mountain's foothills had long been Curiosity's main science destination, even before the rover's November 2011 launch. Mission team members wanted the six-wheeled robot to work its way up through Mount Sharp's lower reaches, studying the rock layers there for clues about Mars' long-ago transition from a relatively warm and wet world to the cold, arid place it is today. And that's what Curiosity has been doing for the past three years. Since arriving at Mount Sharp in September 2014, the robot has climbed about 600 vertical feet (180 meters), drilling, sampling and studying numerous rocks that are part of a geological division that mission scientists call the Murray Formation. Curiosity found that most of this rock is fine-grained mudstone — classic lake-bed deposits, Vasavada said. Such deposits on Earth generally take millions of years to accumulate, leading the team to conclude that Gale Crater's lake system was long-lasting. 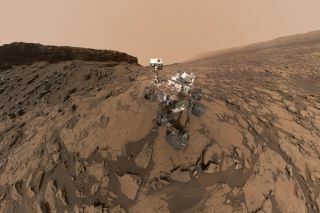 That's a big deal, because Curiosity's work at Yellowknife Bay captured just "a snapshot in time," Vasavada said. Curiosity has already seen some changes during its climb up Mount Sharp. For example, the mudstone was pretty much continuous at and near the mountain's base, but that finely grained stuff gets broken up by other deposits closer to the top of the Murray Formation, Vasavada said. "There are intervals of deposits that are consistent with forming in near-shore environments where rivers are reaching the edge of the lake, or even in dry environments where the lake has presumably receded," he said. "But the lake then reappears." And Gale Crater likely remained habitable even through such periodic dry spells, Vasavada added. That's because groundwater probably remained, even if the lake site was dry on the surface. This groundwater also outlasted the lakes, he said. Mission scientists know this because Curiosity has spotted evidence that liquid water flowed through Gale's lake deposits after they dried out and were buried, compressed and fractured. "So there's a whole other era of water that's, by definition, after the lakes," Vasavada said. "It suggests that the water was there even longer than the timescale of the lakes." Vasavada and his colleagues hope to learn more about this other era, and Gale's early history in general, as Curiosity goes higher up the mountain. Ideally, mission scientists would like to reach three other rock layers that are above the Murray Formation. The first is Vera Rubin Ridge, a feature with lots of the iron-containing mineral hematite; the second is a clay-rich unit; and the third is one dominated by sulfates. The clay unit was probably exposed to lots of liquid water in the ancient past, whereas sulfates imply that water was scarcer, Vasavada said. "There's this idea that you go from the clays to the sulfates, and you're going to be witnessing some kind of drying out of the environment at Gale Crater," he said. "Whether that has anything to do with the global drying out of Mars we'd love to figure out. But at the very least, it's a major environmental change within Gale Crater." Curiosity has already been eyeing Vera Rubin Ridge and should start studying the formation in earnest in the next month or two, Vasavada said. If everything goes according to plan, the rover should get to the clay unit by the end of the year and arrive at the sulfate region, which is about 650 feet (200 m) above Curiosity's current location, a year or two after that. "In the next three years or so, we'll probably see all of those units," Vasavada said. Curiosity has already far outlasted its warranty; the rover's $2.5 billion mission was originally scheduled to last just two Earth years. The issue lies in the drill feed mechanism, which moves the drill bit forward and backward. Until about a month ago, Curiosity engineers were focused primarily on diagnosing the problem and fixing it in a way that would restore normal drill operations, Vasavada said. But the team is now investigating an alternative drilling method — using the arm itself, not the feed motor, to move the drill. "That requires a lot of work — to figure out if that's safe, and to figure out how to do it, and how to command it," Vasavada said. "But it's promising, and that may be where we concentrate our efforts going forward." Though he and other mission team members are chiefly concerned with the future — fixing the drill and continuing Curiosity's climb up Mount Sharp, for example — the events of Aug. 5, 2012, still have a special place in Vasavada's heart. "When I look at the landing video, I still get really emotional; I have a hard time giving talks when I show the video, because it takes me like a minute to recover," he said. "It's remembering the emotion of that night, where your whole career is depending on seven minutes of this stuff going right — and when it actually did work, realizing that you had a future." Note: Space.com Senior Producer Steve Spaleta contributed to this report.